The news roundup of the day includes Ivan Sosa's victory, Vincenzo Nibali's plans for the Vuelta, Hagens Berman Axeon's crowdfunding update, Boels-Dolmans's win in Sweden and a Bahrain-Merida contract extension. The Colombian rider of Androni-Giocattoli has taken the victory of the Spanish race at the last stage by winning the final stage at the Lagunas de Neila. Sosa crossed the finish line 19 seconds ahead of Miguel Angel Lopez (Astana) which was enough to take the overall victory of the race. The Italian rider has confirmed to La Gazzetta Dello Sport that he will be at the starting line of the Vuelta a España. Nibali crashed at the 12th stage of the 2018 Tour de France and broke a vertebra, but after a surgery and rehabilitation, he's ready to return to racing. "Yes, I will ride the Vuelta," said the Italian to La Gazzetta Dello Sport. "My ticket to the departure of Malaga has already been booked. I will fly to Spain on the 22nd of August." The American Professional Continental team launched a few days ago a crowfunding to pay for the rehabilitation of its rider Adrien Costa, who lost one leg at a climbing accident in California. The GoFundMe campaign surpassed the 100.000-dollar goal in three days. Clement Chevrier, David de la Cruz, Owain Doull, Quick-Step Floors, Daan Olivier, Romain Bardet, Laurens ten Dam, Lennard Hofstede, Laurens De Plus, Petr Vakoc and Alex Dowsett, among many others made their donations for the rider's rehabilitation. The Dutch team has taken the victory at the Vårgårda team time trial for the third year in a row. The squad completed the route in 53 minutes and seven seconds and were 16 seconds faster than World team time trial champion, Sunweb. 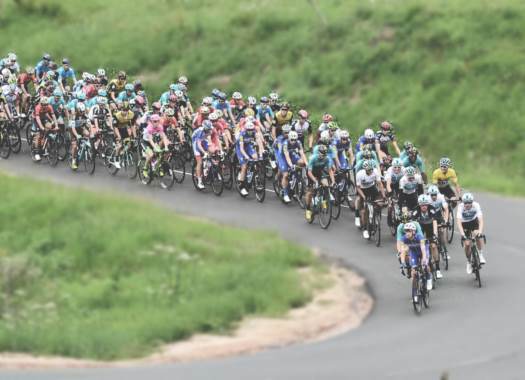 Boels-Dolmans included riders that have been participating at the European Championships like Anna van der Breggen, Amalie Dideriksen and Amy Pieters, but that didn't stop them from taking the victory on a Swedish rainy day. Cervelo-Bigla stepped on the third step of the final podium. The Ukranian rider has shown his talents in his first season at the team in races like the Tour of the Alps, where he took a solo victory. "My first year with this team is going amazing and I am very happy to stay here for the next 2 years," said the rider. "Mark is a rider we at Bahrain Merida have worked exceptionally well with since the start of our working relationship," said Bahrain-Merida's General Manager Brent Copeland. "He is one of the biggest assets and one of the most talented young riders in the pro peloton and we know his worth. For this reason, all team management believes in him and has extended his contract."